I have always been drawn to the majestic-looking egret. As a child, I was always excited to spot them in the marsh, at the edge of the creek in the low country where I grew up. The introverted side of me appreciated their solitude and statuesque stillness as they patiently waited for the right moment to reach down and grab their dinner as it swam by. Every time I saw one, whether looking down as we drove over a bridge or at eye-level in a boat racing through the creeks, I would stop and stare until it was out of sight. There is a tranquil beauty to the marsh and it was accentuated by the egret’s presence, with her snowy white feathers popping out among the darker green grasses. I cling to this unhurried image even more now as I often rush around town like a chicken with my head cut off! I was inspired to create this piece after hearing about the Deepwater Horizon oil spill in the Gulf of Mexico in 2010. It was the largest accidental marine spill in history and the oil flowed non-stop for 3 months. It released at least 4.9 million barrels of crude oil. And as the oil moved toward shore and washed into the marsh I thought about the animal life I knew would be affected. And I thought about the egret. 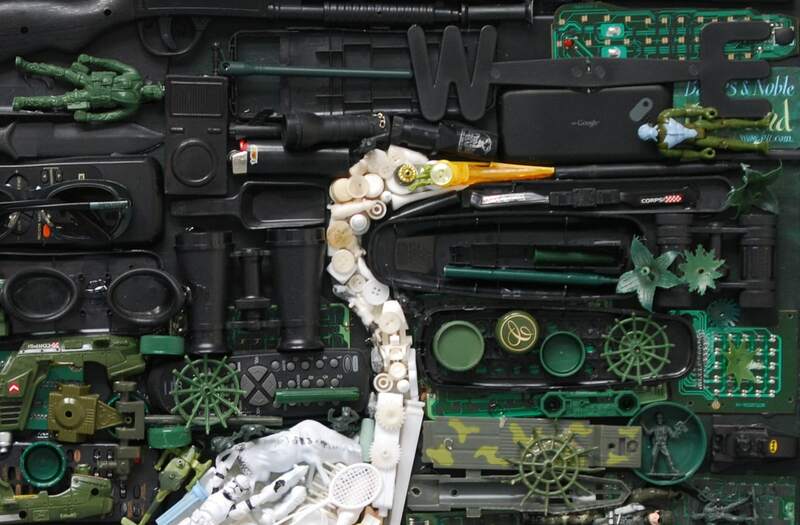 This piece is created primarily from plastic, which comes from crude oil. It includes toys, pens, bottle caps, toothbrushes, and other household items. “Great Egret” is currently on display at the McKissick Museum of Art on the USC campus and will be on sale at the Gala Fundraiser, A Sense of Place, August 24th.